John Donovan is the chief strategy officer at CircleBack Lending, and he was formerly a co-founder and executive at Lending Club. Here's his response to the lender's troubles this year. John Donovan is a co-founder, former board member, and former chief operating officer at the online lending marketplace Lending Club (NYSE:LC). Today, Donovan is the chief strategy officer at CircleBack Lending, another marketplace lender. I recently sat down with Donovan to discuss the state of the marketplace lending sector, as well as to get a better understanding of the challenges facing Lending Club specifically. The following excerpt of that interview has been edited lightly for clarity and length. You can listen to the full interview by clicking here. 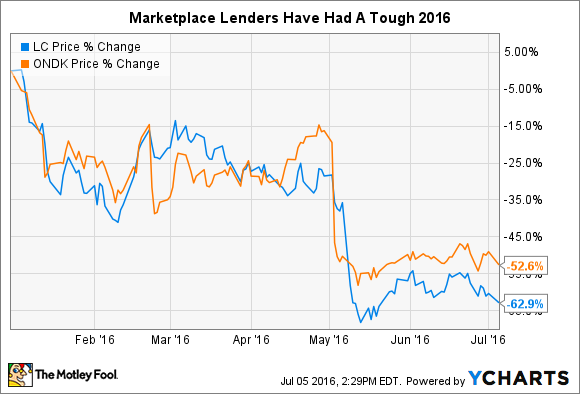 Jenkins: 2016 has been a very tough year for marketplace lenders. Lending Club, On Deck Capital (NYSE:ONDK), and other players are all down sharply. What started the decline in Lending Club's stock that we've seen since May? Donovan: The trigger was a $3 million security that didn't meet investor's requirements, but not for underwriting, not for pricing, none of those things. It was basically a disclosure error, and it's worth noting that it was part of one of the company's first securitizations. As Lending Club was putting together the loans to sell into that securitization, they were asked by Jefferies Group (UNKNOWN:JEF.DL) to put a disclosure on the front of these loans. What ended up happening, as best as we can tell, is they sold some of those loans without the disclosure. Someone internally went and changed some dates on those loans. That was uncovered internally, the company did an investigation into it, bought back the loans from Jefferies at par, and then sold them to someone else. Jenkins: It sounds like your view is that this very much appears as an isolated incident, and not representative of a culture that could create deeper, longer-term repercussions for the stock? Should shareholders be concerned? Donovan: What I look at from the outside is that this could point to some internal control issues. Do the products people talk to the technology people? Where are those Chinese walls? Was this an isolated incident perpetrated by a few individuals, or part of something larger? I think the company has answered those concerns at this point, and I don't have concerns that this is a larger, culture problem. After the issues were found, Lending Club had an accounting firm go do a deep dive into all the different loans. They didn't find any other issues. So, this is something that happened with literally their first securitization and the first pool of loans selling into that securitization. Jenkins: How should a marketplace lender handle credit underwriting and loan review? Investors seem confused as to exactly how this process happens and what the risks are compared to a traditional bank. Donovan: Sure, let's go into that review process. The person comes to the website and applies for a loan. The credit bureau and a bunch of other third-party data is pulled and analyzed, and the applicant is approved or denied. Compared to a traditional bank, this can be done much more efficiently, because the bank application may come in based on a written application, it may come in online, or it may come in through the telephone. Because [an online marketplace] is mono-channel, it tends to be more efficiently managed. There's also a lot more data, so when a person's coming in and applying on their computer, from an anti-fraud standpoint, marketplace lenders can go in and say, "Okay, hey, John's applying for a loan. His credit passes, the IP address on his computer says Chicago, but we can see on his LinkedIn profile that he works in San Francisco. Hmm, might this be fraud? Do we need to do some additional verification?" From the perspective of safety and security, I think that marketplace lenders are actually safer from the standpoint of anti-fraud that credit card issuers. Jenkins: And on the credit underwriting side? Donovan: Underwriting is not a process of, "Hey, we're going to go issue these loans and believe that the climate is going to stay exactly the same." Things change over time, so you're always going in and looking at your book. There are a bunch of things that may drive losses slightly higher for a certain loan portfolio, and there are a bunch of ways that you go through and address that. You can change underwriting guidelines. You [can] isolate risks between different channels if the data shows one with carry greater risk. You can address that through changing your pricing. All of this happens in real-time, constantly adjusting for supply and demand, as well as changing economic conditions. It's a live, vibrant process, and that's a huge advantage. The platform can start pushing applicants more toward three year loans rather than five year loans. You start to look at different geographies, and respond precisely to where the problems are the worst. It tends to be, in consumer credit at least, are you talking about prime, near-prime, or sub-prime? Tough economic times tend to hit sub-prime first and foremost. By monitoring these trends in real time, as we talked about before, the marketplace lenders can react proactively. Jenkins: Some critics have pointed to the lack of a human touch in the process. Where do humans, versus algorithms, come into the picture, and is this appropriate, in your view? Donovan: Absolutely. If you look at the process, let's say 85% of applicants are declined automatically, and there is no human intervention. At that point, you end up with, let's say, 15%, and there you're going in and saying, "Hey, do we need to do additional income verification? Do we need to do employment verification, do we want to get this person on the phone and make a phone call? What are the other types of verification that are necessary?" It's interesting, as I read a lot of things, people say, "You should verify 100%." Guess what, the banks don't do much income verification at all from the standpoint of credit card applications. Even from a bank issuing a credit card with a $10,000 balance, it's doubtful they're going to go through and do income verification. From the standpoint of marketplace lenders, when you start to look at who you should verify and who you shouldn't verify, there was data that Lending Club put out a few years ago, which said that losses on loans where income is verified are actually higher than the losses on loans where income is not verified. If you think about that, it actually makes perfect sense, because the company is only verifying income when there is an additional level of risk that warrants the verification of data. Jenkins: While at Lending Club, one of your responsibilities was managing the relationships with the institutional investors purchasing loans on the platform. Based on your experience, do you think these funding partners are reacting the same way the stock market has to all this turmoil -- the internal control concerns, the CEO's firing, etc.? Donovan: It depends on the type of entity that you are, right? If you're a bank or an insurance company, then you're looking and you're saying, "There's a control issue, I need to understand that before I put additional funds on it." I think that was the effort recently with the review and audit. It was the company showing how it was addressing the concerns. I think once they get that stamp of approval for bank and insurance money, that capital will come back in. From the standpoint of hedge funds, other funds, other institutional equity, I don't think they have the same constraints. From everything I've read, it seems like that money is still available. Jenkins: You're no longer with Lending Club, but you remain in the marketplace lending industry, currently as the chief strategy officer at CircleBack Lending. What drew you to CircleBack, and how does it compare to your prior experiences? What lessons have you learned in your prior jobs at Lending Club, MasterCard and so on, that make CircleBack different and exciting to you? Donovan: CircleBack is a medium-sized platform that's done about $450 million in loans. The difference, really, there, is much more of a focus on partnerships, so being able to support regional banks, make it more efficient for them to be able to both fund the loans and monetize their customer base. If they've got a mortgage book that they could sell in installment loans, they can't afford to do it on their own, so how can you partner with entities such as regional banks, regional issuers, other types of businesses that have large customer groups that may need this type of responsible credit? It's still marketplace lending, it's just a slightly different angle.